Dangerous Driving is now available for pre order everywhere! Seems like the perfect time to tell you more of the details of the game. 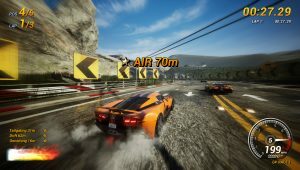 In this blog post we will cover the Game Modes and single player progression. 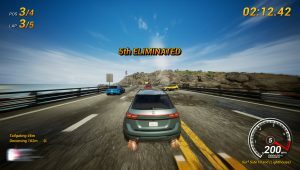 Completing events unlocks new events and new cars. 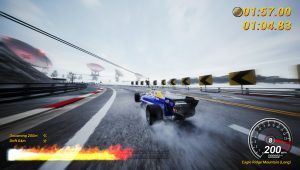 More info on the cars will be revealed in another blog post coming soon. Here is some info and screens on each of the single player game modes. Takedown based Races against 5 AI controlled vehicles. Players fight to be first. 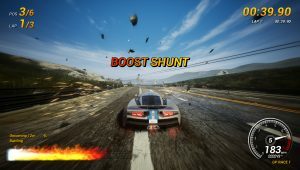 Dangerous and aggressive driving (near misses, drifting, driving in oncoming, near misses, battling) all earn boost allowing players to go even faster. 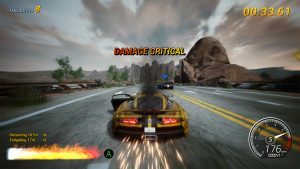 Crash and you’ll get the chance to take Rival racers down with you using your Danger Time Aftertouch (allows you to steer your wreck in slow motion). Taking down Rivals adds an extra chunk of Boost and fills the boost bar. 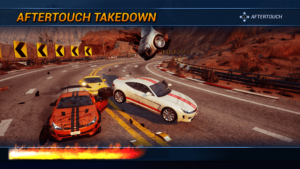 Taken down vehicles remain on the road making subsequent laps ever more dangerous! We call these ‘Persistent Wrecks’. A purer Race event (harking back to an earlier time) against 5 AI racers. 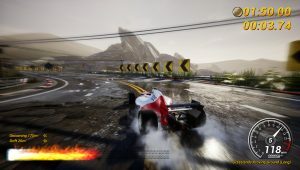 Takedowns are not active in this mode so players must rely on their racing skill. 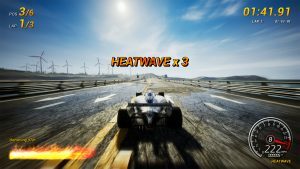 Dropping a whole boost bar in one go refills the boost (called a Heatwave), allowing players to chain Heatwaves together. 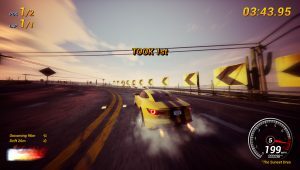 The best car for this event is the Tuned version of each Car Class (which have to be unlocked by playing other events). 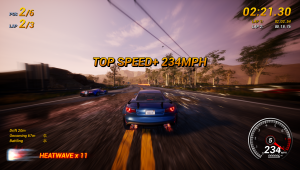 In a Tuned car each chain combo adds 2 mph to the car’s top speed. Face Offs are 1:1 events against a single Rival to win their car. This is the main way new cars are unlocked and you’ll want them for the benefits they give (more on this later). 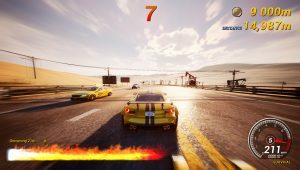 The Rival is racing flat out so the only way to win is to slow them down via Takedowns whilst avoiding crashing yourself. A Boost Start off the start line is essential! A fast lap against the clock. Medals are awarded based on Time alone. 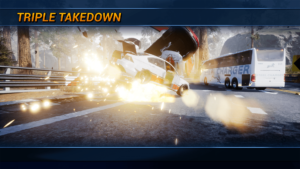 Some Shakedown events are Previews giving players a chance to race cars that they haven’t unlocked yet. One competitor is eliminated each lap in this 5 lap race. If you’re in last place the position counter will flash red. Takedown your Rivals to get ahead and avoid elimination. The pressure really mounts on Lap 5 where wrecks from earlier laps threaten to plunge you into last place at any moment! 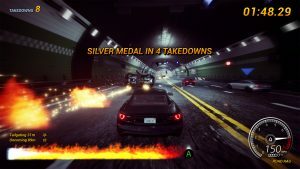 Players compete across 3 Takedown Race events to see who will win overall. Points are carried forward. Every Class of events ends with a GP Event. 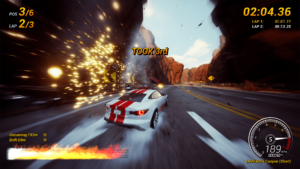 A solo event where players race through a series of checkpoints – how long can you survive without crashing or running out of time? Checkpoints get tighter and traffic gets heavier the further into the game players progress. 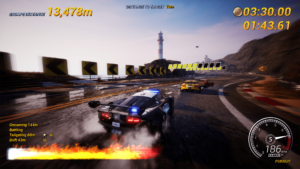 Play as the cops and Takedown Targets before they escape. The number of Targets and the amount of traffic escalates throughout the game. Later Pursuits have Targets with varied amount of Health. 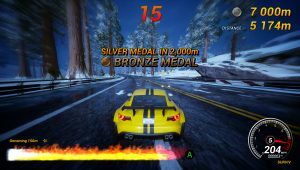 Players start with a Cop Sedan but can unlock SUV and Supercar versions by earning a Gold Medal on certain events. How many Takedowns can players score against the clock? Later events have special rules – no shunts; only Traffic Takedowns apply. That’s all 9 single player game modes included in the game at launch. 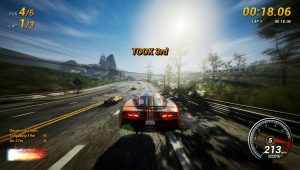 Complete events to unlock new events and new cars as you progress. 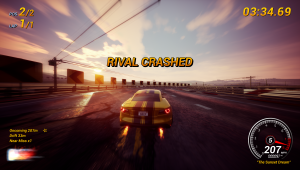 Persistent wrecks – take a Rival down and their wreck remains on the road. Take someone down into a persistent wreck for a ‘Junkyard Takedown’. Crash into one yourself and it’s a ‘Nervous Wreck’. And believe us you will be a nervous wreck when trying to win a tough race against 5 fierce competitors and there are wrecks littering the last lap! 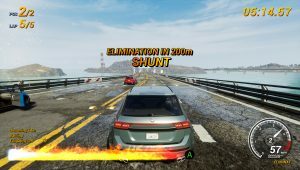 Doing a Heatwave event in a Tuned car – Heatwave events are most like Burnout 2 style races – a return to a time before the Takedown was invented! 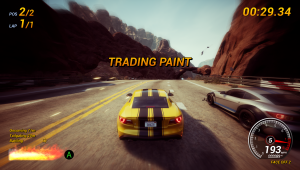 They are about purer racing – so no Takedowns! Drop a Heatwave bar of boost in one go and you’ll get a Heatwave bonus (which refills your boost). 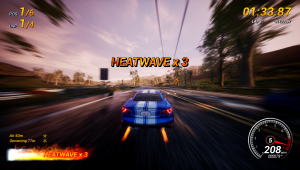 And when you are racing in a Tuned vehicle each successful Heatwave combo adds 2 mph to the car’s top speed. You’ll need to be ‘in the zone’ to survive! 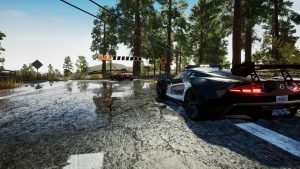 Crash and your top speed is back to normal. 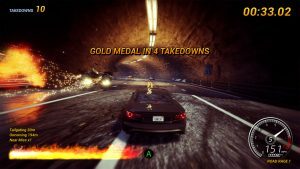 Road Rage – that most popular of modes in this genre is back – and later events feature some rule changes – how many Takedowns can you score when Shunts are disabled – or when only Traffic Takedowns count? Online play – we are excited to release the online version of the game in Month 1 of release. 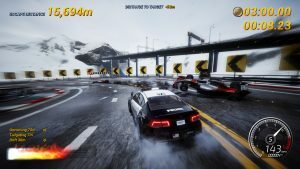 There will be online racing and of course online Road Rage – and persistent wrecks, Junkyard Takedowns and Nervous Wrecks (see above) will all feature strongly. 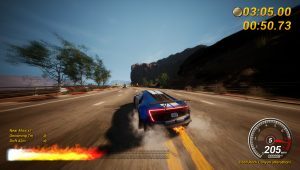 Don’t forget the pre orders are live for the game now – it is a massive help if you do pre order the game as it helps retailers, including the PlayStation and Xbox One store people, see how much excitement there is for the game. More pre orders = hopefully better store placement and marketing support = more sales. Look for a new blog post very soon! We’ve got lots to share – sign up to our Dangerous Driving Club and never miss another update !